We’ll be looking at two previews of Mega Man: Dr. Wily’s Revenge, checking them out for similarities and differences, between each other and the final game. First let’s take a look at Gamepro #19 from February, 1991. Lists all the correct robot masters to appear, and the basics of choosing the stage and gaining new weapons. Mentions a “Transporter” vehicle, in-game would call it the “Carry” item. 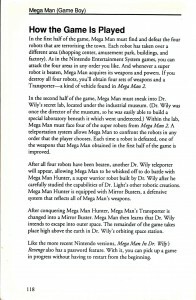 The duel with the Mega Man Hunter (a.k.a. Enker) and his special ability the Mirror Buster. Final battle in a space station with Wily and Wily Machine. Not bad. But how about some of the more strange things? The screenshots appear to be from an early version of Cut Man’s stage, but with fairly different tile and background graphics. 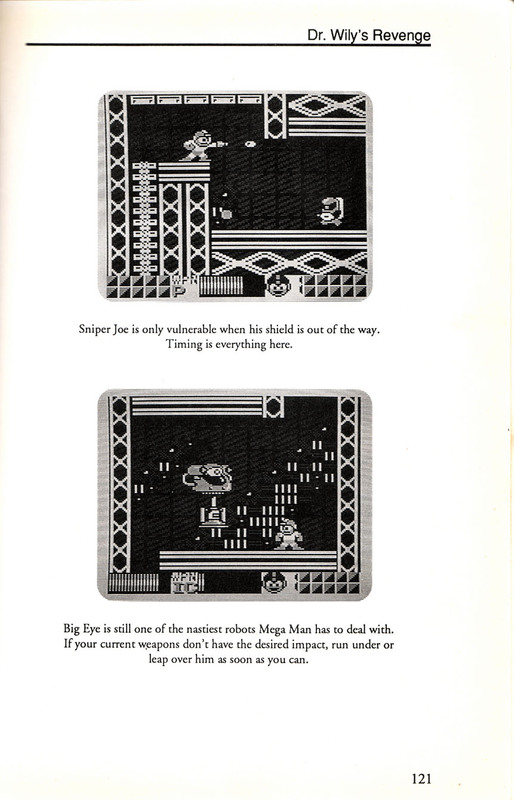 They also showcase Mega Man using Cut Man’s weapon (in the final you cannot return to a level once the boss is defeated), and use a tiled placeholder at the screen bottom when not in use. 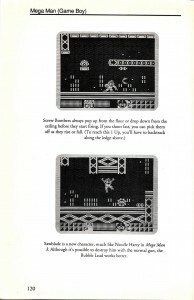 This was shown in the American instruction booklet, but not used in the final version of the game. 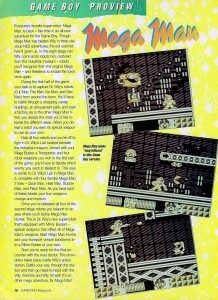 The article calls it an eight stage cart, then later goes on to call the returning Mega Man 2 bosses “the second stage robots”. I guess they meant the second round of bosses? By actual count, there are 6 stages (levels/worlds) in the game. Your transport vehicle becomes a Mirror Buster? Strange, it sure looks like a special weapon from Mega Man’s arm cannon. 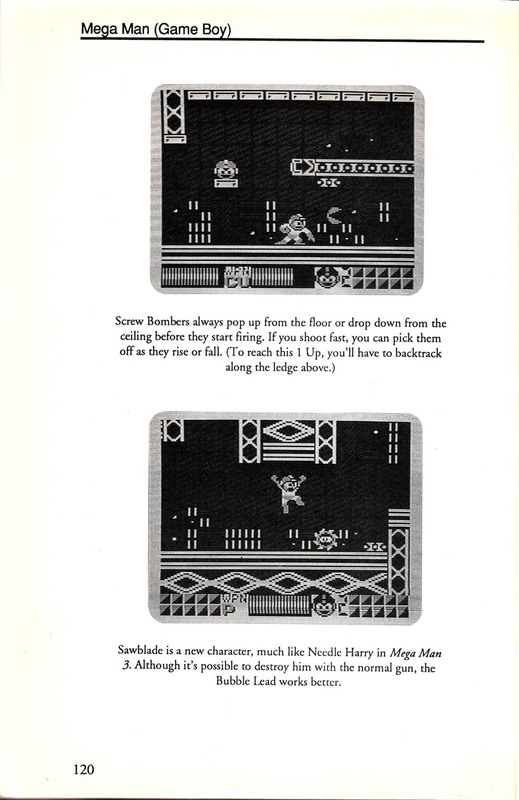 Now let’s take a look at some pages from The Official Guide to Mega Man, another guide book from early 1991 that dealt with the upcoming game. Ready? Very similar to the Gamepro Proview, but written more elaborately on story ideas without the same focus on which boss characters would appear. This version shares a lot of the same quirks, like the Transporter becoming a Mirror Buster. It also sports the same screenshots, plus one featuring the new “Sawblade” (Cutting Wheel) enemy. Both mention the industrial museum as Wily’s base of operations. It’s interesting since the game’s US manual gives far fewer details about the story than either of these previews do. They also mention the four areas of the city occupied by the first wave of robot masters are locations like a shopping center, an amusement park, a factory, and “buildings”. Thinking about the stages, there’s not much to go on as to which were supposed to be what. Would you shop or vacation at any of those stages? Maybe if I could jump 8 feet in the air and had a gun built into my arm. 2 Comments to "Revenge of the Press Release"
Interesting. 🙂 I own TOGtMM, and I still dunno how they came to the conclusion that one of the stages was a shopping center…For the military, maybe? 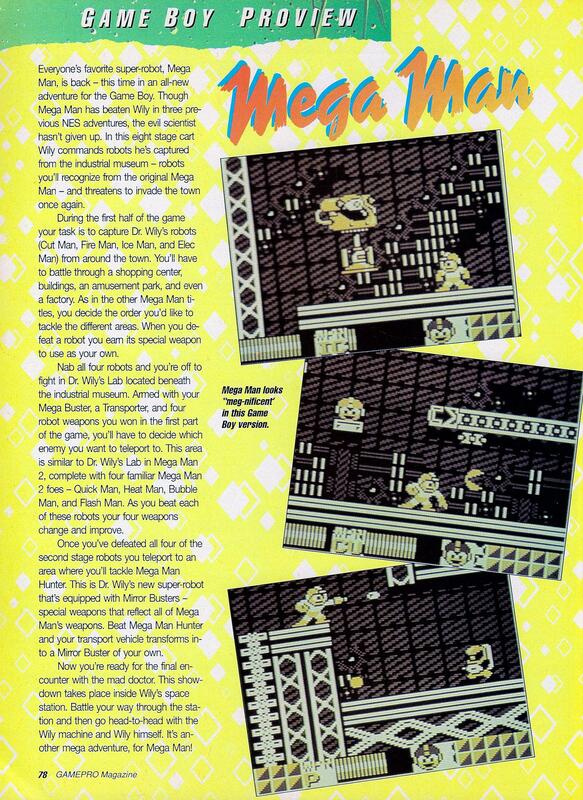 I didn’t even notice this at first, but the GamePro magazine scan uses the term “Mega Buster” in Feb of 1991… almost a year before Mega Man 4 came out. Which means it might be one of the first times the term was used by published materials in the English regions. 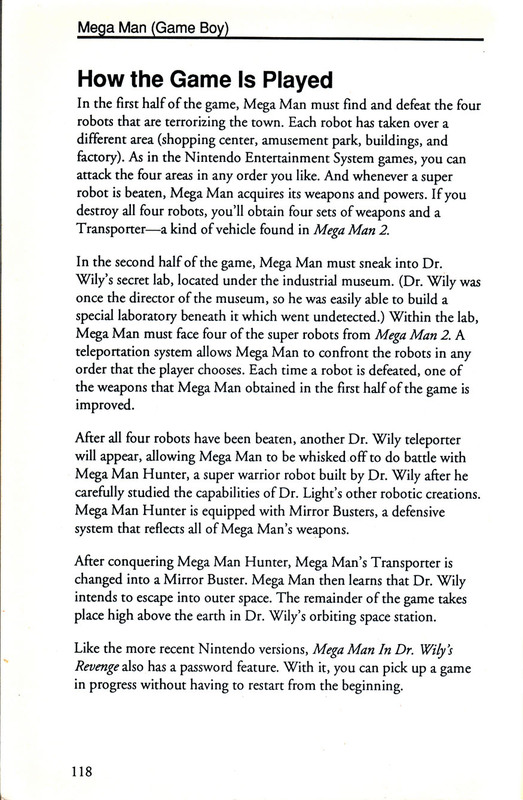 Guess that might settle any “Mega Buster didn’t exist until Mega Man 4!” debates, if people still have those. « First Post on Interordi.com!